Your Maths Masters collect Barbies. OK, now that we have your undivided attention we’ll get on with the column. So, here we are, trying to overcome centuries of the discouragement of women from academic pursuits (and most everything else), and in waltzes Barbie portraying the worst “girls can’t do maths” stereotype. Of course there were howls of protest and production of Anti-Maths Barbie quickly ceased. She became a collectors’ item and is now very rare (and expensive). After years of hunting, your Maths Masters finally obtained one. It is not only your Maths Masters who have the sought-after Anti-Maths Barbie; she has been a very convenient villain. She makes a guest appearance, for instance, in the recent work of psychologist Dr Sarah Buckley. 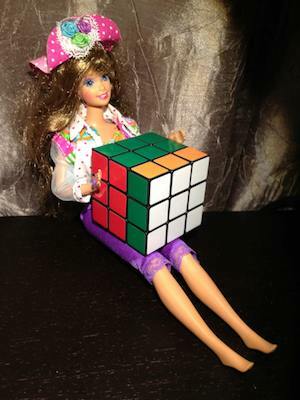 Dr Buckley’s PhD thesis was on the sources of maths anxiety, making Barbie a fine symbol for the specific anti-maths that Dr Buckley has been analysing. Just one problem: Barbie is right and Dr Buckley is wrong. Well that’s not completely accurate. There is much on which we can agree with Dr Buckley and we do not mean to dismiss her research out of hand. However, in promoting her work through various media outlets Dr Buckley placed particular emphasis upon myths that interfere with a happy and healthy attitude to mathematics. It is the nature of some of these oft-claimed myths with which we take serious issue. Central to Dr Buckley's discussion are the myths that mathematics (beyond a little arithmetic) is only for smart kids, or for kids intending a scientific or technical career. We couldn't agree more, however Dr Buckley's arguments to debunk those myths are troubling. For your Maths Masters, the argument that all kids can benefit from learning mathematics is simple: schooling should be primarily about learning to think, and mathematics demands and teaches precise thinking as well as or better than any other discipline. Moreover, we believe that mathematics is beautiful and that everyone is capable of appreciating that beauty. Done. Dr Buckley briefly mentions the argument that mathematics promotes general thinking skills. However she appears to place much more emphasis upon the familiar and false claim that our modern technological world requires a technologically literate populace. It has somehow escaped everybody's notice that there are millions of technologically illiterate Australians who are nonetheless successful and happy. Of even greater concern is Dr Buckley's strategy for fighting maths anxiety by directly fighting the fear of maths and the perception that maths is hard. As indicated by the title of one of Dr Buckley's articles, her opinion is Relax, there is nothing to fear in mathematics but fear itself. Nonsense. There is plenty to fear in mathematics. Great mathematicians struggled for centuries to shape our mathematics into its current form. The 16th-century mathematician Girolamo Cardano referred to the "mental tortures" involved, and the great Gottfried Leibniz discussed his battles with "monsters of the ideal world". These sentiments are typical; mathematics has always caused headaches. Perhaps it's only more advanced mathematics that is difficult? Arithmetic and other primary school maths is pretty easy, right? Sorry, but no. Primary school mathematics is the most difficult of all. Our modern methods of calculation are based upon positional notation and decimals, and it took thousands and thousands of years to figure out. Negative numbers? Thousands and thousands of years. Fractions? Let’s talk a bit about fractions. The ancient Greeks, those brilliant geometers, had no proper notion of fractions. Again, it took thousands of years to sort out and it is still mighty tough. It is so hard to realize that 2/6 does not mean “2 divided by 6”, that it is not the process of division but the result of that process. It is a huge mental leap to realise that 2/6 and 1/3 are one and the same thing, and that thing is only an idea in the mind. It is so easy to get it wrong, and even respected VCE textbooks can do so. Is there anything we can do to make mathematics easier? Of course. We can focus upon the ideas, and the time-tested algorithms that simplify the necessary mental processes. We can emphasise those mental processes and the need for sharp mental skills. We can emphasise the beautiful and intuitive patterns and we can make it all fun. We can also clear out the needless jungle of jargon, arcane topics and pseudoapplications. It's worth noting that Barbie didn't specifically complain about mathematics: it was maths class that she found tough, and she was right to do so. Maths class can be more than tough; it can be tough to stay awake. But the most valuable thing we can do is to simply stop repeating the ridiculous falsehood that mathematics is easy. We can stop replacing genuine mathematics by a cheap fake in an attempt to sell that falsehood. And In particular we can stop pretending that a calculator, that most insidious of lies, can possibly help; we can stop pretending that all that button-pushing is anything more than a cowardly avoidance of mathematics. Mathematics is tough, pure and simple. Amazingly, for once and only once, we should all sit back for a moment and listen to Barbie. Marty Ross is a mathematical nomad. His hobby is helping Barbie smash calculators (and iPads) with a hammer.